Barclays is preparing to pay bonuses to its staff of more than £2bn, the BBC has learned. But the bank, which did not take any direct state help during the financial crisis, is expected to say it is paying out less than it normally would. 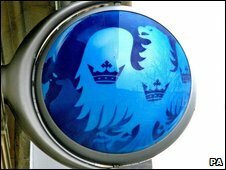 Barclays will reveal its full-year results on Tuesday and is expected to announce profits of about £10.3bn for 2009 - up 70% on the year before. Royal Bank of Scotland is expected to pay out £1.3bn in bonuses. The rise in profits means there are still likely to be multimillion-pound handouts for Barclays' top bankers. Barclays is expected to pay out around £4.5bn in total remuneration to the 23,000 investment bankers employed at its investment bank, Barclays Capital. Both Barclays and RBS will say that they are responding to the public's mood of unease... and are showing "restraint"
Average pay for Barclays Capital's 23,000 employees will be about £196,000 and just under half of this will be in the form of bonuses. The large profits enjoyed by bankers prompted widespread public anger because they were widely perceived to have taken dangerous risks which led to the global recession. BBC business editor Robert Peston said: "Bank chiefs insist they are paying out less of their revenues as bonuses than they normally do to show they are sensitive to the mood of the public." The semi-nationalised Royal Bank of Scotland has "more or less agreed" with UK Financial Investments, which looks after the taxpayer's controlling 84% stake in the bank, that it will pay out £1.3bn in bonuses, Robert Peston added. Have Goldman charges opened floodgates?